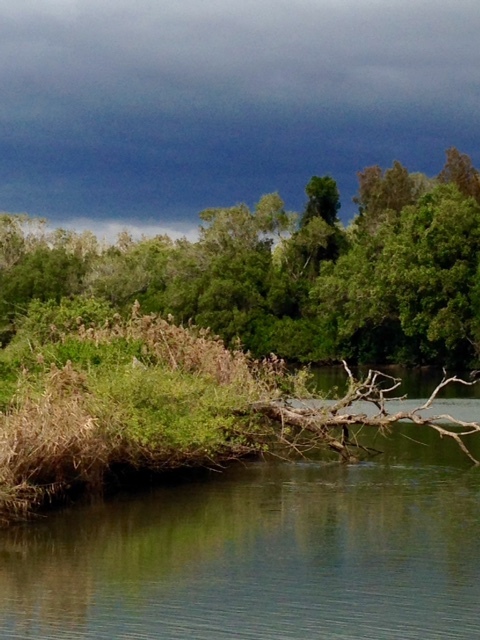 Many people have never heard of the Rous River but 150 years ago it was more important than the Tweed River. The Rous and Tweed Rivers converge at Tumbulgum where the original settlement was across the river from the present village at a place called The Tweed Junction. It was accessed by two ferries that crossed the Tweed and the Rous Rivers. Sadly all that remains now are some old wooden pylons on the river bank. Later this year there will be celebrations to commemorate the original Tweed settlement and in particular, the period since the ferry began operating 150 years. Bluey Hill was an early settler; he operated the ferry that crossed the Rous River for 30 years and is remembered today by a park named in his honour. How do I know this, when most don't? I enjoyed a wonderful tour on The Spirit of Wollumbin which is owned and operated by Michael Simmons from Mount Warning Tours. Michael is a walking, talking encyclopaedia of the history of the beautiful region of the Tweed Caldera. 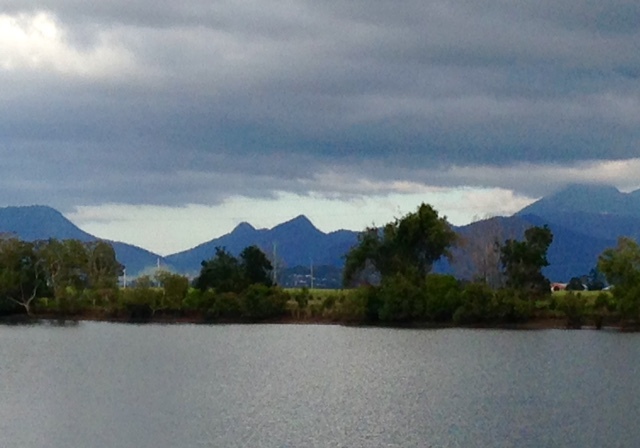 Views to Mount Warning from The Spirit of Wollumbin on an overcast morning in August. Michael gave an excellent commentary as we sailed quietly on the newly refitted Huon Pine ferry; firstly along the Tweed River to Stotts Island and then up the Rous River. Stotts Island Nature Reserve is a rainforest island of 148 acres, with ancient, dense vegetation that has never been cleared. It's also unique in that it's a partially floating island. There's only about 300 acres of subtropical, flood plain rainforest like this left in the state of NSW. It's also the last significant habitat for the endangered Mitchell's Rainforest Snail. 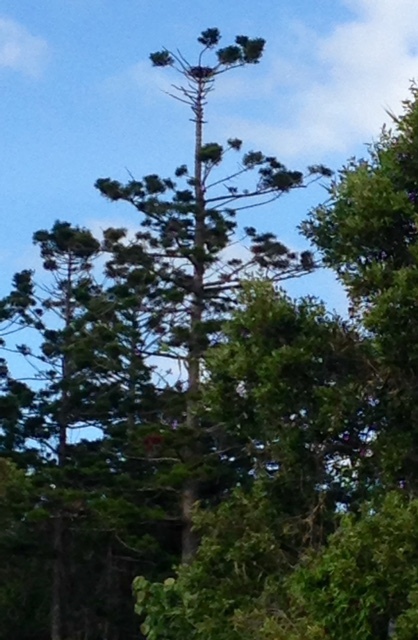 The rainforest has incredible diversity with Bangalow Palms, Red Cedar, Hoop Pines and White Beech to name just a few. Untouched rainforest on Stotts Island. There is also diverse bird life; many of the raptors, the predatory birds of the Tweed, call Stotts Island home. There are 24 varieties to be found in Australia and 18 of them have been sighted in the Tweed Valley; birds such as Kites, Falcons, Sea Eagles, Ospreys and Eagles. As we quietly glided up the Rous River, which runs parallel to the Tweed River, our interest in an almost forgotten history was stirred. Captain John Rous was the first to sail and survey the river (and gave it his name) as he sought to recapture 9 convicts who had escaped from the Moreton Bay Penal Settlement. There was a time when it was a thriving commercial hub for the area. The Rous River was the highway for woodcutters who cleared tons of cedar before sugar cane and dairy farming became the predominant industries. There were 5 sugar mills, 2 inns and a timber mill in the area. The industry has gone and the village is now on the other side of the river but it's now a haven for birds and a bird watcher's paradise. On a single cruise, 42 different species have been spotted. Farming has changed and diversified; most dairy and banana farms are gone. There's still some sugar cane but there's also native bush tucker, lime and lemon orchards and the location of a new Ginnery run by the Messenger family. However, as we sailed, we could still see evidence of the time when the Rous River was a commercial highway for timber, sugar cane and milk and cream from the dairy farms. Evidence of the commercial importance of the Rous River. 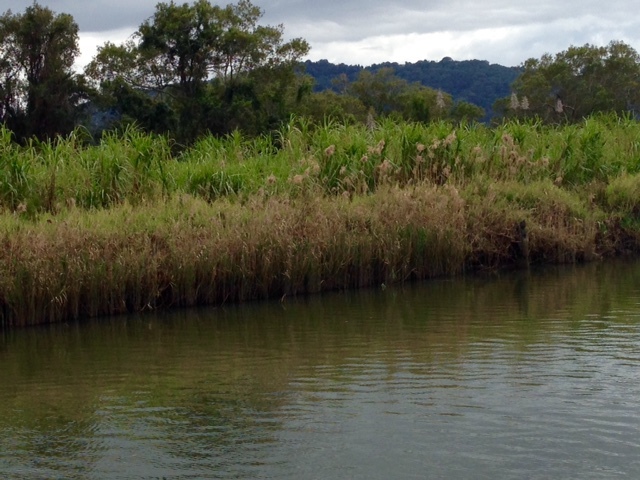 The posts are all that remain of a place where bales of sugar cane were loaded onto boats. As we relaxed in the beautiful natural environment and sailed peacefully on the river I took the opportunity to ask Michael Simmons about Mount Warning Tours and his expanded business on the water. 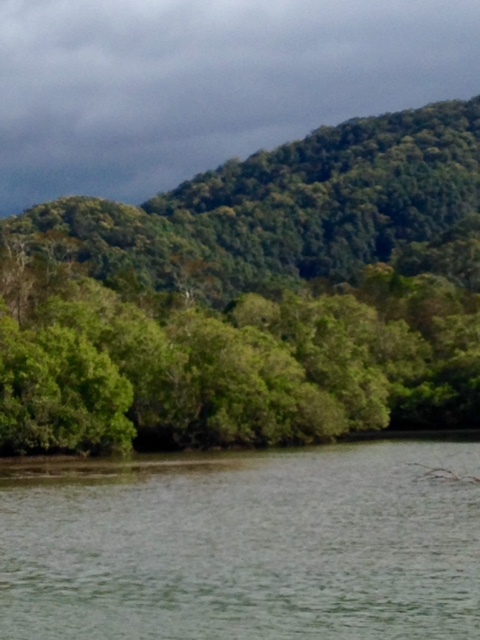 View from Spirit of Wollumbin as we sailed the quiet Rous River. Michael told me he has been in the hospitality and tourism industry for 31 years in Australia and overseas. When he returned to the Tweed region 6 years ago he saw the untapped potential of the local river system. His passion is to share the beauty and magnificence of one of the most important and stunning natural environments in the world, with locals and tourists alike. His emphasis is on sustainable, responsible eco-tourism. He searched for a boat (and found the former ferry, now the Spirit of Wollumbin) that would make minimal wake and therefore cause minimal damage to the fragile eco system of the river banks. 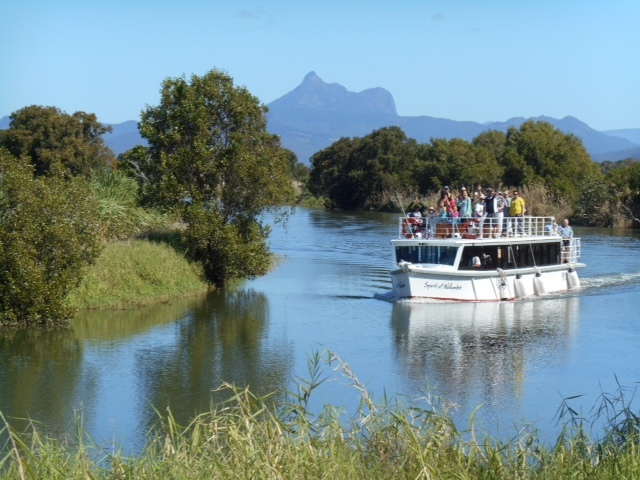 Mount Warning Tours design tours that are fun, relaxing and informative however you can also hire either the Pontoon or the Spirit of Wollumbin for private functions such as parties, weddings, corporate events etc. Personalised tours can be organised on request. Kayaking and Stand Up Paddle boarding activities are also available. The team at Mount Warning Tours works closely with Tweed Fusion, Tweed Foodie Fest and Destination Tweed. Michael Simmons is passionate about combining different elements of the region in his tours, to provide natural experiences, for example local food, art and culture in collaboration with other businesses and organisations in the area. Mount Warning Tours has been recognized for excellence in tourism. Recently it was awarded BEATS Winner 2016 for the category 'Best Visitor Experience Tweed Valley'. They were also the winner in 2015 'Best Tourism Operation Tweed Valley' and in 2016 they were a finalist in 'Regional Business Awards Best Visitor Experience'. 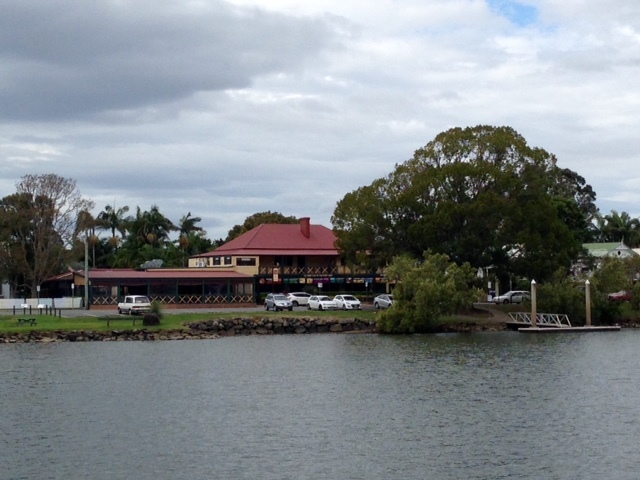 Looking towards Tumbulgum Tavern as we return to shore. 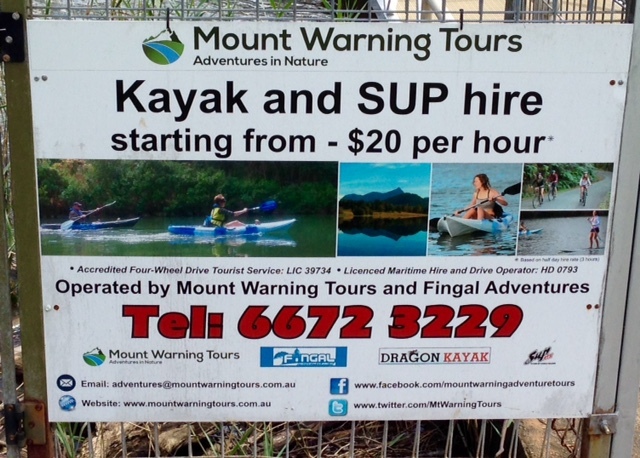 Mount Warning Tours also provide experiences in camping, bus tours, 6X6, hiking, 4XD, mountain biking, Indigenous Cultural Tours, full day, overnight and half day tours. Phone contact (02) 6672 3229 or visit the office in Prospero St, Murwillumbah. 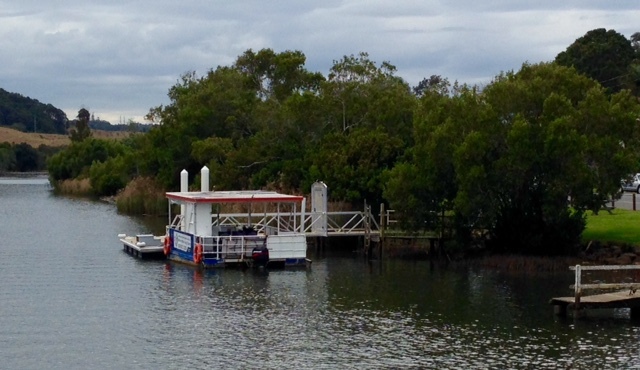 The Pontoon moored at Tumbulgum is ideal for small groups. All river cruises depart from Tumbulgum. Departs: Friday, Saturday, Sunday from 2.30pm. Other times on request. There are also alcohol and snack inclusions. Phone (02) 6672 3229 to book. What an interesting cruise, Anaya - and a beautiful part of Australia! A very reasonably priced tour although the boat looked a little crowded. I don't know rhat I would feel very secure up top. I loved the names Tumbulgum and Wollumbin.